Neil Diamond’s ‘Sweet Caroline’ has become boxing’s adopted anthem these days, belted out lustily by fans at almost every major promotion before the big fight begins. Now, into the ring comes a shy young lady from south London who seems about to make it literally her tune. Caroline Dubois, 17, is already being hailed by critics who know their stuff not only as the new Nicola Adams but as potentially the best female boxer ever. Now I know many are ambivalent about women’s boxing, some even abhor it, but I have always championed the female right to box if they so desire. Why not when women can now even fight on the front line in war these days? And this bellicose teenager certainly carries some impressive artillery. She is just back from Buenos Aires having acquired the Youth Olympic Games gold medal at lightweight, beating Thailand’s Porntip Buapa to remain undefeated in 35 contests which have included becoming Britain’s first world youth champion (overwhelming Russia’s Asatrian Nune in Hungary), three European youth golds, twice Euronean Union women’s junior champion and four-times national youth champion, making her arguably England’s most decorated amateur boxer. 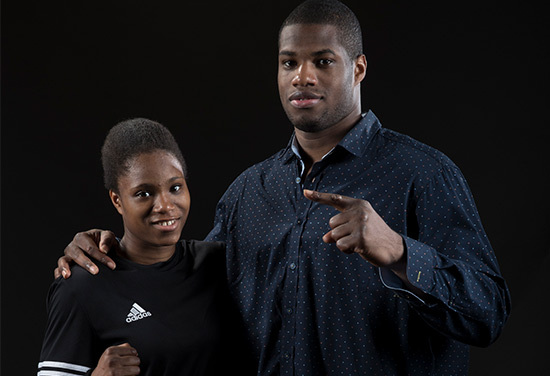 She also happens to be the little sister of Britain’s outstanding pro heavyweight prospect, the unbeaten big-hitter Daniel Dubois, who had his ninth successive victory recently under Frank Warren’s Queensberry banner. As a nine-year-old, Caroline had pretended to be a boy named Colin just so she could join a boxing club. “She might just be the best female boxer you’ve seen but there is a case that at under 18 years of age she might just be the best female athlete in the world, in any sport. “Before you go ‘wow that’s too much’, let’s ask is there a swimmer or a runner as good as her by comparison? Is there a 17-year-old out there dominating like she is or running comparative times? I know there’s not a 17-year-old footballer out there or a rugby player or cricketer. Stylewise Caroline really is sweet. She boxes from a southpaw stance and has a long, languid approach, with exceptional timing. As Costello points out, now and again the punches are a little bit too long or too wide but all of it is born of natural gifts. “After winning the first two rounds in the Youth Olympic final she knew the Thai opponent would come at her and indeed the opponent virtually ran after her. She was timing this check hook from her right hand. It was the kind of punch that Floyd Mayweather started the beginning of the end for Ricky Hatton with in 2007. “She was catching her so cleanly with it and that is a really difficult punch to throw. I’m not too sure how strong across the board the competition was at the Youth Olympics but she was a cut above it. “When you compare it to what Katie Taylor or Nicola Adams have done or other Olympic gold medallists, OK they have achieved at a higher level so you may wonder why I am saying this. The quiet and unassuming Dubois often works out at the Peacock Gym in London’s Canning Town, where her big brother also does a large chunk of his work in preparing for his professional bouts. Daniel chose the pro game over waiting for a shot at Olympic gold as part of GB’s team, a chance which looks set to come his younger sister’s way. She and Daniel are from a Greenwich-based family of 11 children and Daniel says of her achievements: “She is just phenomenal, amazing. “She is a world champion, Olympic youth champion and I predict that in two years’ time she will be Olympic champion. That is, if boxing remains on the Olympic programme in Tokyo. There is genuine concern that it may be given the heave-ho because of issues with the the International Olympic Committee over serious financial and political irregularities within its governance and leadership. The IOC has raised concerns covering more than a dozen areas in the operation of AIBA, the International Boxing Federation. The IOC awaits a report on the electoral outcome of the federation congress in Moscow this weekend before deciding whether to take further punitive action against the governing body. As I have said here before, there are several ‘snowflakes’ on the IOC (and I suspect president Thomas Bach may be among them) who would welcome its replacement by a less hazardous and subjective activity. But my guess – and hope – is that it will remain, possibly with the IOC allowing boxers to participate though refusing to accredit some of AIBA’s controversial leadership, as happened with the Youth Olympics. If this proves not to be the case and boxing is sensationally ko’d – then we can expect Sweet Caroline to be in evidence both vocally and physically when Dubois makes her pro debut. Who knows, she is in Katy Taylor’s lightweight division so might she be the Irish icon’s eventual nemesis?